The world’s largest crane will start work at the Hinkley nuclear site next year for the BYLOR joint venture of Bouygues and Laing O’Rourke. 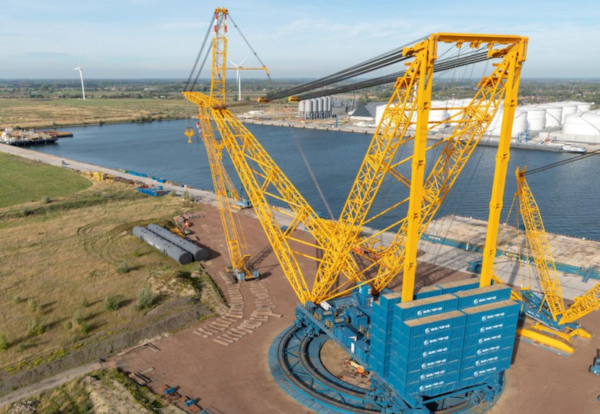 The SGC-250 (Sarens Giant Crane-250) can lift 5,000 tonnes and operate at a height of 250 metres and radius of 275 metres. At Hinkley a rail network constructed on site means the giant machine will be able to travel between different key lift locations. It will be used to move more than 600 pre-fabricated components including the five major parts of each nuclear unit’s steel containment liner and dome. The SGC-250 was launched earlier this month at the port of Ghent in Belgium by Sarens. It will be moved to a lay down yard near Hinkley before 280 trucks runs will be required to deliver the entire SGC to the site.